The Emergency Department has moved to Gate 35, Level 0, Brunel building, Southmead Hospital, BS10 5NB. Hoardings are around the Frenchay site, including gates at all entrances, to make the site safe. These do not affect the ability to access remaining services. Use Entrance B, the Museum entrance, to access Beckspool Building, HITU and Headway. Use the Beckspool Road entrance for BIRU and Employment Services. There is no vehicle access to Lime Tree Avenue. From the M4, exit at junction 19 and take the M32 towards Bristol. The Frenchay Site is situated just off the M32 Motorway. Leave the M32 at junction 1 (signposted Kingswood and Downend) and at the roundabout off the slip road turn left, following signs to Frenchay Hospital (B4058) and Kingswood. At the first set of traffic lights take the right filter lane. Proceed along Frenchay Park Road. For the most up to date information contact either Traveline 0871 2002233 or the appropriate bus company. 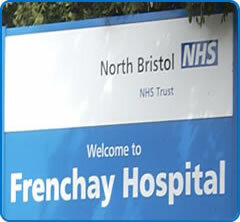 If you need to travel between Frenchay and Southmead Hospitals the First Bus number 18 service stops outside Frenchay and on Southmead site. The nearest stations are Bristol Parkway and Filton Abbeywood. For information on cycling visit Better by Bike. Cycle racks at Frenchay Hospital are available at various locations. Car parking is currently free. Create a personalised travel plan and discover your options on how you can best travel to our hospitals. The myPTP tool is the only journey planner that gives you bus, train, walking, cycling and car sharing options.